It’s a story not unfamiliar to me, having grown up in a Catholic family: God asks Abraham to sacrifice his only son, Isaac, and because his love for his God is so strong, Abraham agrees, stopped only at the last moment by an angel sent from heaven, who provides him with a ram to sacrifice in Isaac’s stead. In the Muslim tradition, Ibrahim (Abraham), is asked to sacrifice not Isaac but Ishmael, his son by his second wife, Hagar, the handmaiden of his first wife, Sarah. Nonetheless, the essential theme of the story is still the same: that of a man who is willing to do anything for the God he loves. It is this event that is celebrated during Eid al-Adha, or Idul Adha, as it is called in Indonesia. Families and sometimes whole communities come together to pray and to emulate the sacrifice of Ibrahim by sacrificing cows, sheep, or goats of their own. Traditionally, the meat is then divided into three parts, divided equally among the family; friends, relatives, and neighbors; and the poorer members of the community. In the week leading up to this holiday, the landscape I always admired on my ride from the second to first campuses began to be populated more and more by goats, as well as the occasional cow. It was not until I came across a pair of goats outside one of the academic buildings of the second campus that I really made the connection, and began to look forward to experiencing this holiday that, until a World Religions course I took my senior year of college, I confess I did not know existed. Idul Adha, from my experience, is an all-weekend affair. On Saturday, one of my students invited me to a “performance” that would occur later that evening. I stepped into the hall above the library and found it had been redecorated to celebrate “Epic El Adha.” It was the kind of gala that could have only been planned by high school students: there was storytelling and singing, and the loudest supportive cheering I have ever heard. I understood only one of the stories, told by a brave student who had memorized her tale in English, but I was enraptured by the way in which students twisted their hands and wove their tales out of the air; I am sure their words were absolute magic. The antics of the singing performances were easier to find familiar, as students pulled out their sass and dramatics and more often than not sought to emulate K-Pop videos. I don’t know if I have smiled so much since coming to Malang. 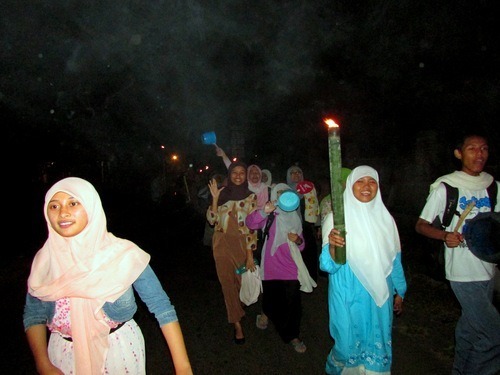 After the performances, the students lined up outside of the dorms, preparing to parade about the surrounding village with flashlights, torches, and noise-makers. I had only intended to watch the parade until it left the school grounds, but one of the students persuaded me to come along with them, saying, “You’ll never see anything like this in America.” I did not have to be asked twice. It was a loud and smoky experience, and as I watched some of the male students put water bottles smelling distinctly of gasoline to their lips so they could breathe fire using the torches they carried, I could not help but note that this was the kind of event that American schools would never allow. I am not sure whether I am thankful or sorry for our safety regulations, but I am glad I had the opportunity to be swept along by students as they laughed and smiled and called out phrases I could not understand. On Sunday the actual sacrifices occurred. I missed what, at the time, I though was the main event because I had been waiting in my room for those who said they would fetch me, before realizing I had been forgotten in the excitement and decided to find my own way there. 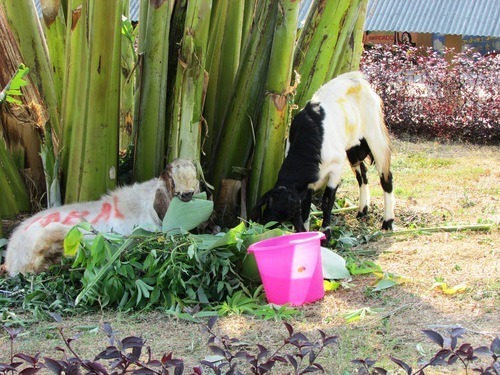 By the time I arrived, the cow and two goats were already laid out on the grass being skinned and sectioned by some of the male teachers, staff, and older students. One of the students met me as I approached and observed, “I think you are late, Miss.” I smiled, and tried to decide whether I was disappointed or relieved. I was never given the chance to come to a conclusion. Some of the students invited me to where the meat was being divided: some for the school, some for the families who had donated the animals, and some for the surrounding community. Older men hacked at joints until the meat was in more manageable pieces, and then it was everyone else’s job to carve the meat into smaller pieces, to be bagged and sorted for distribution. Students worked together in groups to accomplish this task, laughing good-naturedly at their friends’ struggles and receiving occasional helpful advice from the bapak-bapak who were supervising the whole affair, and who often seemed every bit as amused as the students. I helped a group of girls cut and weigh beef still warm from the life that had coursed through it only that morning with a small knife too dull for the task and a scale from one of the science labs. At first, the students seemed doubtful as to whether or not they could trust their American teacher’s stomach around so much blood and flesh, but I quickly proved the utility of my steady farm girl hands as I gripped slippery chunks of meat and held on tight while my students leaned into their knives and cut it into the proper portions. I held, they cut, the roles were reversed, and all the while we exchanged stories of different celebrations in our respective countries and words for different cuts of meat in our respective languages. Later on, I was again able to make good use of my years of living on a dairy farm and being involved in my local 4-H club when two boys hauled over a basket of cattle organs. Sitting on top of the heap was a piece of the reticulum, my favorite part of the ruminant stomach, and, without thinking, I expressed my excitement. After learning from some of the students that they knew nothing of the wonders of animals with four compartments in their stomachs, I headed over to where these incredible innards had been unceremoniously dumped, awaiting their turn to be weighted and sorted, and asked the bapak-bapak nearby, “Maaf, boleh punya itu?” They looked more than a little puzzled, but happily acquiesced, and soon I was trying to explain the different roles of each part of the stomach, using the simplest English I could manage. The students, in turn, told me about a soup which would later be made from the very pieces of organ I was holding. I have been told it is a dish I must try. I am not sure if this is the kind of cultural exchange I agreed to facilitate when I signed up for my year as a Fulbright ETA. I have the nagging suspicion that the joke many of my fellow ETAs made at orientation might just turn out to be true, and my students will end up learning more about dairy cows during my time here than about American culture, however that is defined. But as I continued to help divide meat—we had by this time moved on to the two goats—with my students, sang along to the One Direction playing from someone’s mobile phone, and laughed at the boys who had commandeered a nearby hose to cool themselves after skinning the animals, I decided I was happy with this experience, and that that was all the defining it needed. 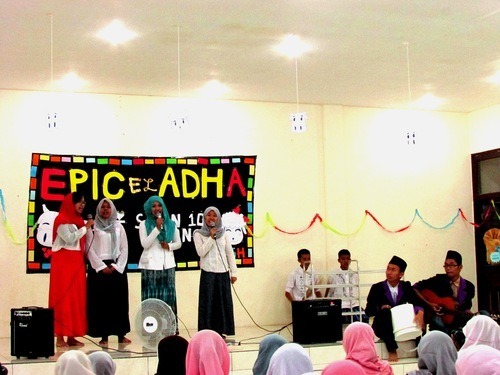 This entry was posted in Uncategorized and tagged Cultural Exchange, Eid al-Adha, Experiences, Idul Adha, Indonesia, Ruminants, Teachable Moments, travel, travel blog. Bookmark the permalink. ← Welcome to SMAN 10 Malang!